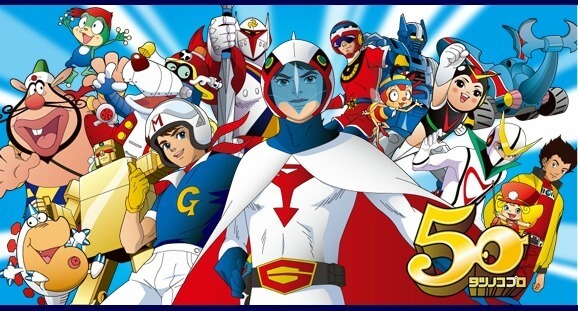 Tatsunoko Production Company (株式会社タツノコプロ Kabushiki gaisha Tatsunoko Puro), previously known as Kabushiki gaisha Tatsunoko Purodakushon (株式会社竜の子プロダクション) and often shortened to Tatsunoko Pro (竜の子プロ or タツノコプロ Tatsunoko Puro), is a Japanese animation company. It was founded in October 1962 by anime pioneer Tatsuo Yoshida and his brothers, Kenji and Toyoharu (pen name “Ippei Kuri”). The studio’s name has a double meaning in Japanese: “Tatsu’s child” (Tatsu is a nickname for Tatsuo) and “sea dragon”, the inspiration for its seahorse logo. Tatsunoko’s headquarters are in Musashino, Tokyo.